Txx Will and Tech N9ne have worked together for many years, so it was great to see them both take the same stage together. 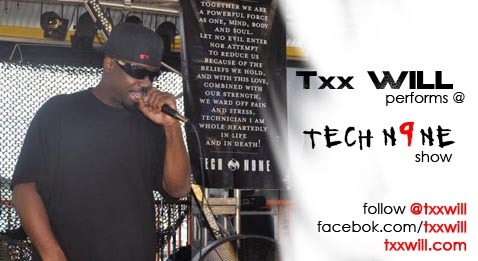 July 21st Txx Will rocked the mic at H. Toads at Camden On The Lake, along with Stevie Stone, Ces Cru, Houston Zizza and others. It was a great turn out and the heat didn’t keep anyone home. It was a perfect opportunity for Will to mingle with the entire Strange roster as well as meet other performers he didn’t know. All in all it was a great time keep posted for the video. Txx Will – Inner City Livin’ Mixtape Volume 1 coming soon!